Swiss Chard Bread – Nutrition.Health.Life. Two months ago I had never had swiss chard before. Last week was the 3rd time our CSA came with a bunch, so I am starting to become more familiar with it. I found a delicious Swiss Chard and Sweet Potato Gratin recipe but felt it was too heavy for summer. I am going to save that for the fall. For now, I was craving some herb-seasoned bread. I found it used in a number of recipes online, so I decided to throw together my loaf. This bread has wonderful texture and flavor. I made the dough in the bread machine but baked it in a loaf pan in the oven – I wanted smaller loaves and didn’t want a hole in the middle. Cut the stems off the chard and place in a food processor. Pulse into small pieces. Add leaves and continue to pulse into small pieces. Remove from the food processor and place into a microwave-save container. Lightly cover the dish and microwave for 1 minute to soften. In the meantime, add basil to the food processor and pulse until finely chopped. Add other spices and oil. Pulse until well mixed. Push down the sides and add the steamed chard. Process for a few seconds to mix well. Lightly spray the bread machine pan with cooking spray to prevent excessive sticking. Add water, salt, oil, and chard mixture first. Then add bread flour. Sprinkle the top with sugar. Scoop a small hole in the center of the flour and place the yeast. Make sure the yeast doesn’t come in contact with the salt (that’s why you put it under the flour)**. Put the bread pan in the bread maker and set on the dough cycle. You can set it on the regular baking cycle if you’re OK with the shape of the bread pan loaf. If you’re going to make the bread in the over, prepare 1 or 2 loaf pans. Once the dough cycle is done, lightly flour the counter and dump the dough onto the flour. Try to touch the dough as little as possible. Split in half and place each half in the baking pan (or all into 1 if you are making a big loaf). Cover pan with a clean towel and let sit for 20-30 minutes in a cool, draft-free place (I use the pantry). Preheat the over to 350F. Once the dough has doubled in in size, DON’T touch the dough. Gently move the pans from their resting spot to the oven. Bake for 35-45 minutes, or until the top is golden. **salt kills yeast, sugar feeds yeast. You put salt in bread to prevent it from over-proofing, so don’t try to be a health freak and omit it all together. The salt in this bread is not the reason we have problems with high blood pressure in this country. 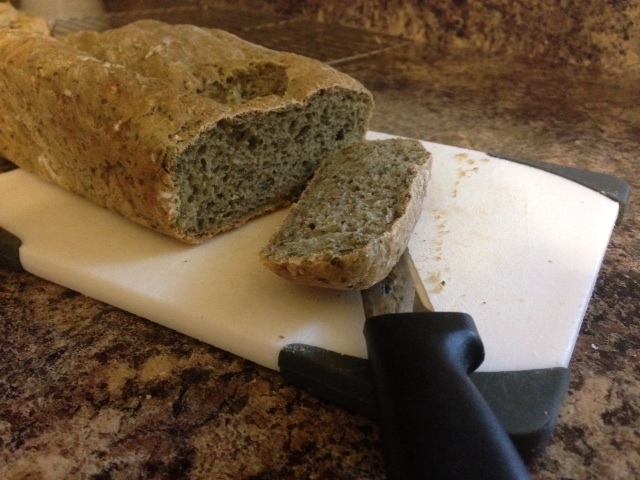 This entry was posted in Nutrition and tagged Breads, CSA, Greens, herbs. Bookmark the permalink. Pingback: CSA Week #15 | Nutrition.Health.Life.